Welcome to our wedding website - we're so excited about the big day! Amy and Vinny met in 2012, when Vinny started working at the Valley Stream Library, where Amy had been working. After casually grabbing bagels together after work one day, Vinny asked Amy out on a proper date - dinner and a movie - and as they say, the rest is history! After dating for a few months, Amy knew he was the one and accidentally dropped the "L" word. "I can't love you if you don't love the red Dorritos!" she said, as Vinny reached for a blue bag of chips. Later that night, he said "I love you" back. What followed was four years of adventures: from movie dates to dinner dates, to trips to museums, Medieval Times, Disney World, Harry Potter World, and the Renn Faire with friends, to apple picking and pumpkin picking, to celebrating birthdays and holidays together. 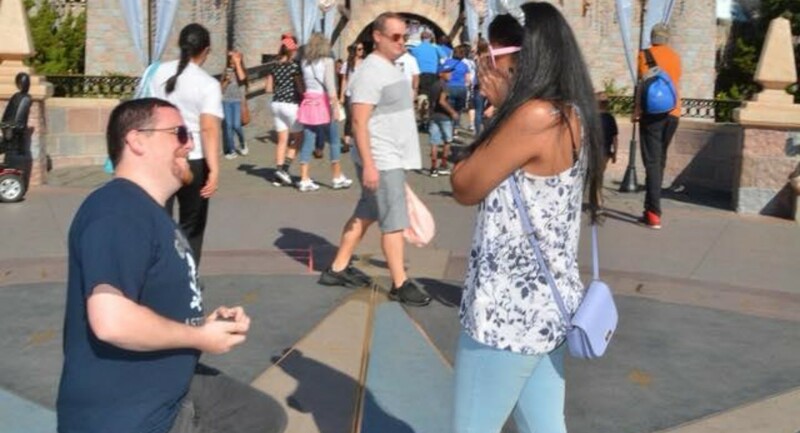 After four wonderful years together, while on a trip to Disneyland with their friends, Vinny got down on one knee and asked Amy to marry him in front of Sleeping Beauty's castle!